Register Log In Primarily Petroliana Shop Talk Forums General Petroliana Discussion M&S 80 restored to Standard & "Royal"
Andrew...I used a razor blade (very carefully) to remove the paint to uncover the Royal ad glass. 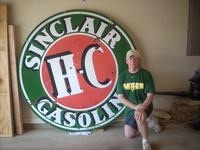 Peter: I have found a treasure trove of photos of Conoco gas pumps and Conoco gas stations on the internet. What is a little creepy is how good the search engines are. Just a few days ago I did a google search on something like "Royal gas pump" to help me research the issues in this thread on Royal ad glass. I got several hits on this specific thread! 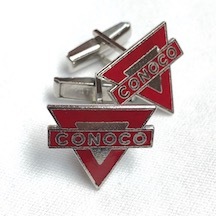 And when I look through the "images" from the google search, I find all of the pumps in this thread, plus the newly taken photo of my Conoco Cufflinks that I am using as my Avatar on this forum.